Flying Storks has the cutest storks in all of Maryland. 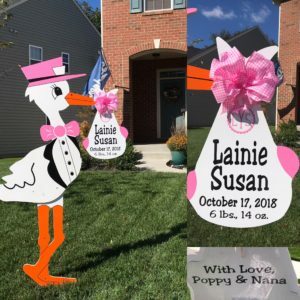 For about the cost of sending Flowers, call and order your Personalized Stork Sign Yard Card Birth Announcement Today! $99 -$125 includes, delivery, pick up, and all Stork Bundle Keepsake customization. We deliver 6′ stork signs for (7) days which include a customized bundle with new baby’s birth data. After (7) days, we pick up the stork sign and leave the personalized bundle. $99 includes delivery, pick-up and keepsake bundle which is left with new parents when we pick up the stork sign. Washington County, Maryland & Loudoun County Virginia, Leesburg, Ashburn, Charlestown, W. Virginia too! 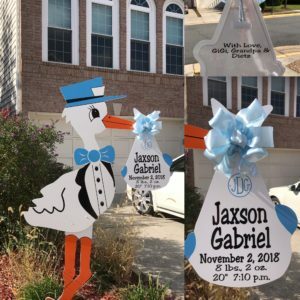 Our Adorable 6-foot stork Yard sign is customized with the baby’s delivery information on a special keepsake bundle that parents will treasure forever. 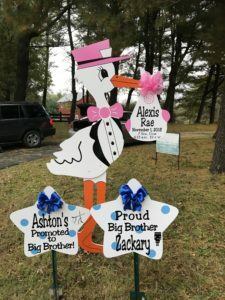 Our stork announcement signs are a unique way for your friends or family to announce their new bundle of joy! Stork yard signs are delivered, installed, and ready to surprise mom & baby when they arrive home from the hospital. At the end of the rental period, the stork is picked up and the customized bundle and beautiful bow are yours to keep! Washington Metro Areas of Maryland & Northern Virginia and parts of West Virginia too. Including: Adamstown, Aspen Hill, Beallsville, Bethesda, Boyds, Braddock Heights, Brunswick, Boonsboro, Boyds, Clarksburg, Catoctin, Damascus, Darnestown, Derwood, Dickerson, Gaithersburg, Germantown, Green Valley, Hagerstown, Ijamsville, Jefferson, Libertytown, Monrovia, Myersville, Middletown, Mt. Airy, North Potomac, North Rockville, Potomac, Point of Rocks, Poolesville, Smithsburg, Thurmont, Urbana, Walkersville, Woodsboro, as well as all of Montgomery and Frederick County, MD. We also Deliver to Harpers Ferry, Ranson & Charlestown, West Virginia, Hamilton, Purcellville, Loudoun County, Virginia, & areas around Leesburg, Lovettsville, Virginia too! We deliver Premium 6′ stork signs for (7) days which include a customized bundle with new baby’s birth data. Stork yard signs are delivered, installed, and ready to surprise mom & baby when they arrive home from the hospital. At the end of the rental period, the stork is picked up and the customized bundle and beautiful bow are yours to keep! Our delivery areas include Washington D. C., Northern Virginia, and Maryland areas: Washington County, Maryland & Loudoun County Virginia, Leesburg, Ashburn, Charlestown, W. Virginia too! Call us at (301) 606-3091 for additional information or to order your stork today! Please follow us on Pinterest and we will gladly return the favor and follow you or your business too. We deliver 6-foot stork Yard signs for (7) days, $99. 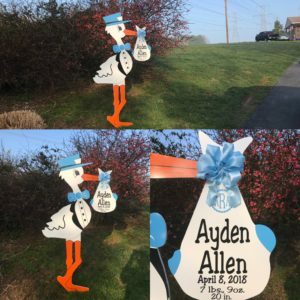 Our Stork Sign Rentals come with a keepsake bundle which is personalized with the baby’s delivery information. Washington Metro Areas of Maryland & Northern Virginia and parts of West Virginia too. Including: Adamstown, Aspen Hill, Beallsville, Bethesda, Boyds, Braddock Heights, Boonsboro, Brunswick, Boyds, Clarksburg, Catoctin, Damascus, Darnestown, Derwood, Dickerson, Gaithersburg, Germantown, Green Valley, Hagerstown, Ijamsville, Jefferson, Leesburg, Libertytown, Monrovia, Myersville, Middletown, Mt. Airy, North Potomac, North Rockville, Potomac, Point of Rocks, Poolesville, Smithsburg, Thurmont, Urbana, Walkersville, Woodsboro, as well as all of Montgomery and Frederick County, MD. We also Deliver to Harpers Ferry, Ranson & Charlestown, West Virginia, Loudoun County, Virginia, & areas around Leesburg, Lovettsville, Virginia too! Washington Metro Areas of Maryland & Northern Virginia and parts of West Virginia too. Including: Adamstown, Aspen Hill, Beallsville, Bethesda, Boyds, Braddock Heights, Brunswick, Boonsboro, Boyds, Clarksburg, Catoctin, Damascus, Darnestown, Derwood, Dickerson, Gaithersburg, Germantown, Green Valley, Hagerstown, Ijamsville, Jefferson, Libertytown, Monrovia, Myersville, Middletown, Mt. Airy, North Potomac, North Rockville, Potomac, Point of Rocks, Poolesville, Smithsburg, Thurmont, Urbana, Walkersville, Woodsboro, as well as all of Montgomery and Frederick County, MD. We also Deliver to Harpers Ferry, Ranson & Charlestown, West Virginia, Loudoun County, Virginia, & areas around Leesburg, Lovettsville, Virginia too! 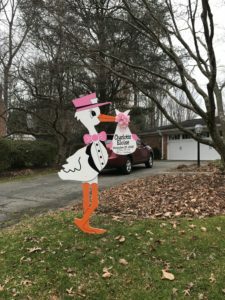 Flying Storks Delivers Lawn Sign Stork Sign Rentals in Maryland, Northern Virginia & Parts of West Virginia Too! Send a unique gift for new parents that will surprise and delight! 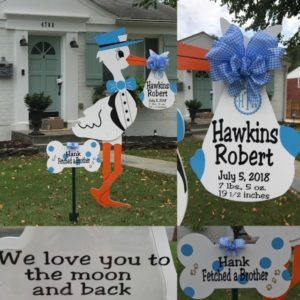 Reserve your Flying Stork lawn sign in advance or try place your order at least 24 hours ahead of expected delivery of newborn baby announcement. Or as soon as the baby arrives, give us a call to request a Flying Stork delivery. 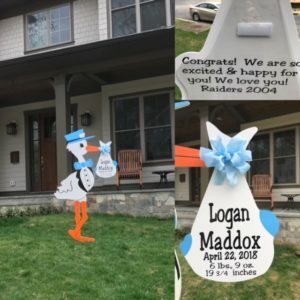 We strive to have Flying Stork Sign delivered before mother and baby arrive home from the hospital. Call us at (301) 606-3091 for more information or to book your stork rental today! Please visit us on FB to see our most current rentals. Please follow us on Pinterest & Instagram. We’re also on Google Plus too! 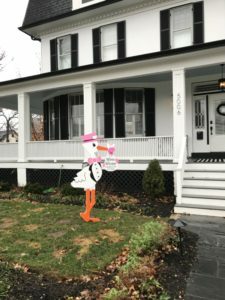 Near and around, Adamstown, Aspen Hill, Beallsville, Bethesda, Bethesda Chevy Chase, B-CC, Boyds, Braddock Heights, Brunswick, Boonsboro, Clarksburg, Damascus, Darnestown, Derwood, Dickerson, Gaithersburg, Germantown, Green Valley, Knoxville, Ijamsville, Jefferson, Monrovia, Myersville, Middletown, Mt. Airy, Olney, Point of Rocks, Potomac, North Potomac, Poolesville, Rockville, Silver Spring, Woodsboro, Urbana, Walkersville, MD. areas around Leesburg, Winchester, Purcellville VA, Harpers Ferry, Charlestown West Virginia & Georgetown Washington D. C.
*We are often able to accommodate rentals that are a greater distance than these areas. Please contact us for more information. How Does It Work and Place an Order? Call us at (301) 606-3091 for additional information or to order your stork today! Please visit our FB Page to see our most current rentals. Please follow us on Pinterest and we will gladly return the favor and follow you or your business too.